Furry Conventions - What do you like? - the polling booth - Furtopia | Family Friendly Furry Forum and IRC Chat! What are your favorite things at a furry convention? Seeing and meeting the Guests of Honor. The Zoo - A spacious general social area. Furry conventions are awesome! I like EVERYTHING! I haven't been to a furry convention.......yet. What are some of the things that you like about furry conventions? Re: Furry Conventions - What do you like? Quite a few on the list I like. Had to choose other activities as well. For me the best thing about a furcon is talking to others about their fersonas. Some furryes have wonderfully complex stories behind their fursona. I usually nose around the Dealer's Den or Artists' Alley. I watched the fursuit dance comp at last year's Califur and I really enjoyed it. I also like the fursuit parade. The Fursuit Parade, Fursuit Dance Competition, Nightly dances and raves, Masquerade, the Panels & Seminars, and the Dealers' Den usually top my list of things I enjoy. 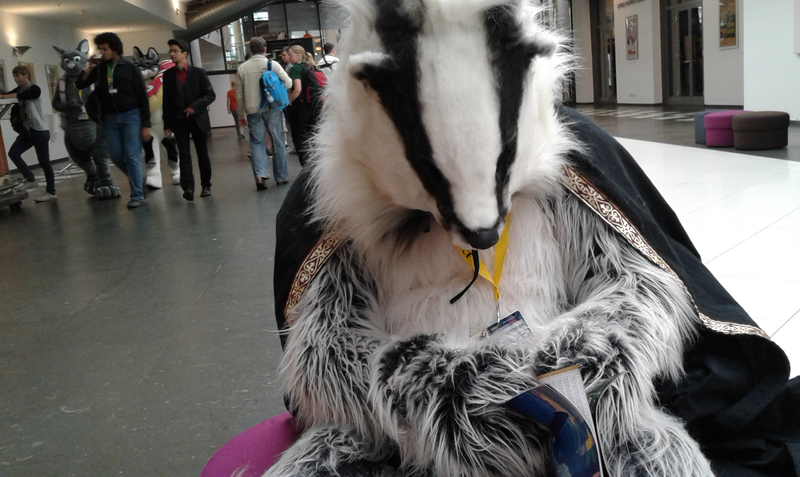 I've been to a con once, and a small one at that: the Dutch FurCon. There were 'only' 90 attendees, so there was no puppetry or comedy or whatever fancy stuff you have at big cons. That said, I'll mention a few things that were at that con. Some weirdo brought their laptop and game controllers to the con, and one login to steam later a few people were busy with video games. I did join the fun there. I was also at an art workshop and a baking workshop, which were interesting. I also met one of my internet friends IRL. Said friend lives in Poland whilst I live here in the Netherlands. Him coming here was no surprise, but I still think it was a bit ridiculous he made this trip to see me for three days. What I enjoyed the most by far was the furwalk. Since it was a smaller con, every attendee could join in if they wanted, fursuit or not. I was so amazed by seeing so many fursuits in one place, I just fell silent. Had I not fallen silent, I'd probably be squeeing like a little girl. If I could squee like a little girl. I'm looking forward to going again this year. seriously. Apart from that, I enjoy suiting up and attending the annual furwalk. I take advantage of the amenities in the Sponsor's Lounge and Headless Lounge. Never miss the Fursuit Parade or Photoshoot. I host a panel almost ever year at MCFC. Unfortunately, there's little pawpetry at this con, but I bring a few anyway. I don't believe there's an internet room there. Love the fursuiters and take as many candid photos as possible of them.